There is something about January that really jolts us into cleaning, organizing, and getting things done. Maybe it's because January follows the crazy rush of Christmas and suddenly we feel like there's time for "us" again. It also feels like the beginning of winter, when we just want to hibernate and need to clear out the cobwebs so our homes feel cozy rather than like a claustrophobic bear den. Yup, maybe that's why! 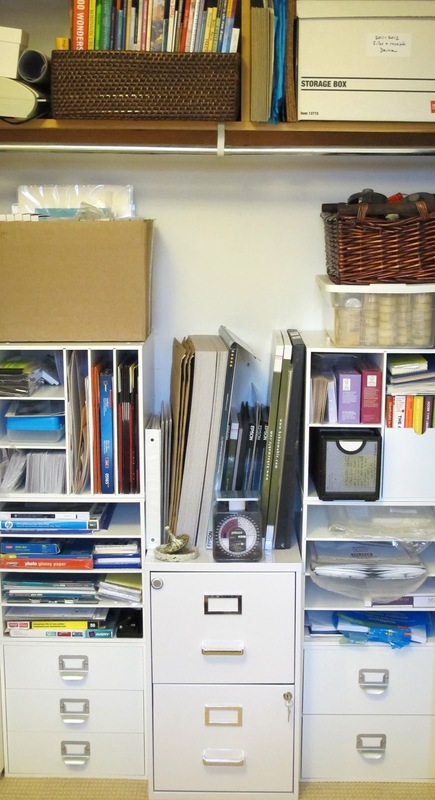 Clearing out our special work spaces really Frees the Mind of clutter. doors make it all vanish like magic! Recollections Storage Cubes @ Michaels. Filing cabinet and boxes @ Staples. You might think that most of my time is spent in my studio, painting. The truth is, I spend hours and hours each week working in my home office. I wear ALL the hats in my business! I'm a bookkeeper, retailer, webpage editor, marketing manager, shipper/receiver, writer, teacher, student, travel agent... on top of being the elderly dog caretaker, the cook, the housekeeper, and the woodstove stoker. And when I feel like it's all a bit too much, I strum a few tunes on my bari uke to loosen up. With big deadlines approaching (like proposals, applications, and taxes), and my mind feeling like a clogged toilet, I knew I had to do something FAST. My home office looked like a bomb had landed, with files and papers strewn everywhere, packing materials, laundry, books, you name it. I could hardly walk, definitely couldn't focus, and forget having an unexpected guest stay over. That would be so embarrassing! 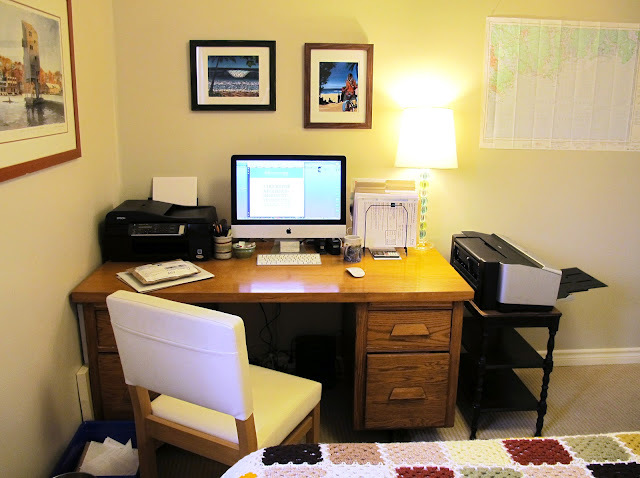 My home office, like many of us small homeowners, doubles as my guest room. I was in luck! Everywhere in town there were 50% off sales. I found some handy craft storage cube organizers, a filing cabinet, and filing boxes. I made give-away piles and recycle piles. Everything that was on the floor, on the bed, in the closet, and on my desk was either purged or organized over 2 full days! Now I have a great workspace where I can focus and feel productive, PLUS I'm ready for sleep-overs! 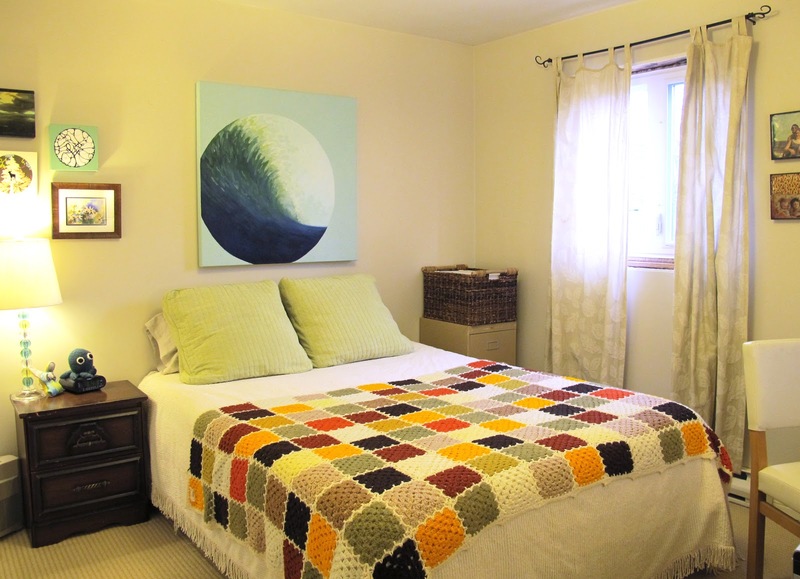 ...and my guest room on the other!